Bangkok has been hit by a thick smog so bad that residents have been coughing and sneezing up blood. The city's pollution problem has got to such a state that even pets are suffering from illnesses caused by the smog. A thick cloud of toxic smog made up of dangerous PM2.5 particles has become lodged in people's lungs and blanketed the Thai capital for the last fortnight. Experts have warned that the long term cost of the pollution caused by vehicles, construction projects, burning crops and street food BBQs could run into tens of millions of dollars. 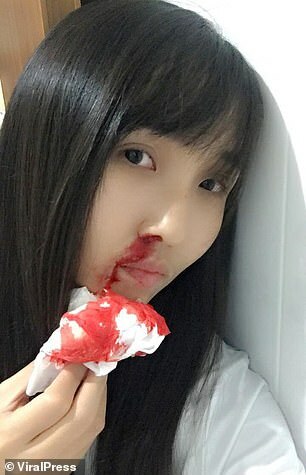 But as pictures posted on social media by citizens show, residents and animals have already been badly affected - sneezing and coughing blood into their face masks. The Thai government has closed 439 schools and taken increasingly bizarre steps to try and fight the pollution - including today flying drones to spray water. But the smog has continued. 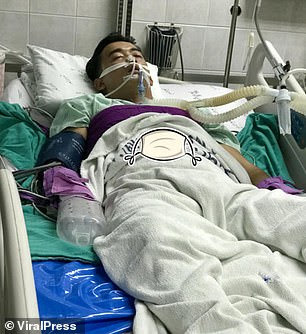 On Tuesday an asthma patient living the city was sent to the hospital's intensive care unit with acute bronchitis and hypoxaemia after his eyes were critically bleeding. The Bangkok haze has continued to worsen and dozens of cases of sick animals have emerged. 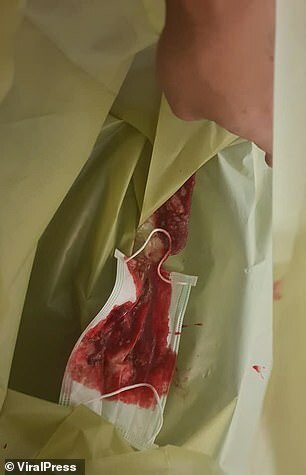 A veterinarian from Pet & Aquatic Animal Hospital said the owner of a rabbit named Jubuu brought her pet to the hospital with blood on its nose. The vet posted onlin said: 'Jubuu has a history of chronic dust allergy and she cannot stop sneezing. 'We look into her nose with a microscope and her nasal cavity is red and swollen.' Jubuu's owner, Oil, and the vet agreed that it must have been poor air pollution because her house was covered with the smog for weeks. Many pet owners were not aware that it could affect their beloved animals. A week ago, a female poodle was taken to the emergency after losing her voice for several days. The X-ray film showed her lungs, trachea, and alveoli were covered with dust causing the breathing difficulty and vocal cord infection. The owner said: 'I never leave her outside for a long time but the dust must come through the window I always open for her while she is staying inside. 'I hope the story of my dog will alert people about how terrible the pollution is. Bangkok's governor today appealed for help to battle the toxic smog shrouding the capital as the deployment of drones left Bangkok residents unimpressed. The murky haze has led to criticism from the public over the government's response, which has veered from playing down the problem to abruptly shutting schools. Bangkok governor Aswin Kwanmuang compounded the sense of frustration by calling on 'all sectors' to find a solution. His plea comes a day after he declared Bangkok a 'control area', closing hundreds of schools until Friday and announcing a ban on cars that use diesel and burning of any kind within the city. Violators run the risk of three-month jail sentences and fines. Junta leader Prayut Chan-O-Cha on Wednesday stepped up rhetoric, appealing to Bangkok residents to carpool and for the army to 'check' factories in all 76 provinces. 'I will ask the army to go and check every factory...and directly report to me,' the premier said. 'People have complained that I don't do this, I don't do that, and children are coughing until blood comes out.' Yesterday the country's prime minister Prayuth Chan-ocha has ordered for the closure of 437 schools after officials said the toxic smog would continue until next Monday. It comes as the Public Health Ministry said people should refrain from outdoor activities and exercise, and look instead for indoor venues. Many commuters and pedestrians have begun wearing face masks to combat the buildup of particles in the atmosphere from still air and heavy traffic. Bangkok's dangerous air pollution makes it vital for the government to take 'decisive action', said UN Environment's regional coordinator for chemicals, waste and air quality Kakuko Nagatani-Yoshida. She said a short-term solution would be to shut down the most severe factory polluters, but that ultimately 'factories will have to convert to cleaner technology and open burning of waste must be stopped'. Authorities remain tense over growing gripes about the haze and the government's risible response, which has started to cloud political debate and worry officials about its impact on tourism during the high season. 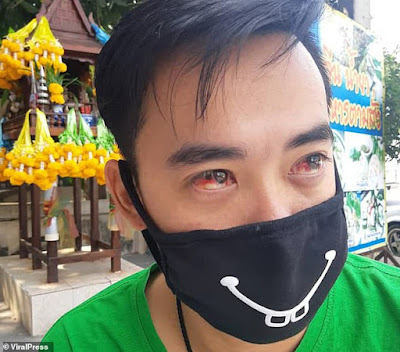 Thai police on Thursday announced the arrest of a man for allegedly posting 'fake news' online after he said a woman had died from the airborne particles. Charged under the Computer Crime Act, 36-year-old Wattana Pitanwattanathitikul will face up to five years in jail if convicted. 'This message not only caused panic among members of the public, but it could also cause economic losses in terms of tourism,' said police spokesman Colonel Siriwat Deephor.